So you walk into a public restroom, impressed with the contemporary décor. Gleaming surfaces. Ultra-modern fixtures. Chrome everywhere. Then you see the futuristic hand dryer, one unlike the typical nozzle-and-push-button machines from the industrial 1950s. There’s no button. No nozzle. You simply thrust your hands into an empty space in a sleek, wall-mounted box, where a high-powered blast of air surrounds your mitts. And that’s where the trouble begins. That’s because these new jet air dryers can actually spread more germs farther than conventional dryers or paper towels. So, they may look cool, but can potentially do more harm. According to a study that was recently reported in the Journal of Applied Microbiology, the jet air dryers launch more germs into the atmosphere farther and those germs linger for longer periods of time. In a controlled environment, researchers applied a virus called MS2 on their hands, then used paper towels, a conventional hand dryer and a jet dryer to dry their hands. For testing purposes, the amount of MS2 applied was equal to the amount someone might have on their hands if they were stricken with the norovirus and didn’t wash properly. Researchers then tested the air in the enclosed room, capturing the virus on plates covered with a thin coating of E. Coli. MS2 kills E. Coli, so by seeing if the E. Coli was dead on plates scattered around the room, researchers could determine the reach and range of germ spread. The researchers also set up different heights for the plates, in order to see how high germ spread would be during the test. 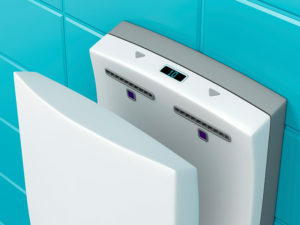 The jet air dryer produced 60 times more virus than the conventional air dryer and 1,300 times more than paper towels. Based on the height of virus transmission, the jet air dryer produced 70% of their germ spread at the height of a typical child’s face. Most shocking was the distance of spread. The dryer spread germs 500 times farther than the warm air dryer and lingered in the air for a full 15 minutes. But won’t viruses already be eliminated once you get to the hand drying stage anyway? Consider this: experts say a proper hand washing means taking the time it takes to slowly sing the “happy birthday” song twice (25 to 30 seconds). Clearly, many people don’t do this. There is a solution, though. AeraMax® Professional air purifiers not only eliminate odors in bathroom settings, but germs and viruses too. So, regardless of whether a bathroom is outfitted with fancy jet dryers, convention warm air dryers or good old paper towels, AeraMax Professional can remove up to 99.9% of contaminants – including viruses – from the air.